I tried reading Twilight – I truly did. And it wasn’t that I disliked the book at all….I just didn’t LOVE it. I find, as someone with only so much time to read, I become somewhat choosy about I do read, so if I don’t find myself loving a book I will often go off and find something to read that I do love. That’s the main reason that I never finished Twilight. The other reason I never finished the book was that I had misunderstood the premise of the book when I began reading it. I thought it would be a vampire book with a little bit of romance in it – instead I found it to be a romance with a few vampires thrown into the mix. So I never finished reading the book. 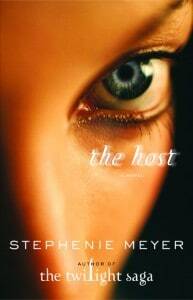 Because I never really have given Stephenie Meyer a chance, I decided to read The Host when I was given the opportunity. Before reading the book I knew one thing – it wasn’t about vampires and I hadn’t heard that it was a romance. Based on those facts, I thought I was ready to read and see if I could enjoy a book by Meyer. I must admit that I didn’t give Meyer enough credit – The Host is a completely different type of book. I was pleasantly surprised to find that it was actually a science-fiction type novel and this novel seemed to be geared to adults. I found the premise of the novel to be interesting – the idea of having an alien race that takes over human bodies and what can happen when someone fights back against the alien trying to overtake her. I liked the themes presented in the novel and how they reflect on embracing yourself and what it means to be human. That being said, I didn’t love the romantic element that seem to sneak its ways into this novel. It was much more tolerable than Twilight because it wasn’t the largest part of the novel, but I didn’t enjoy that aspect of the book. Overall, I was impressed with the novel and I have to say that if the rumours are true and Meyer does release a sequel to The Host, I would read it because I’d be interested to see in what direction this series would go. So even if you are like me, and didn’t enjoy Twilight, I’d suggest that you give The Host a chance because you might enjoy it!